Whether you work as an in-home massage therapist, operate a taco truck, or run some other small business, you're missing sales if you can't process credit cards. In the past, you were pretty much tied to a land-bound credit card terminal. However, there are mobile alternatives. A number of mobile payment tools now let you accept credit cards on an iPhone, an Android handset, a Windows Phone, or a dumber handset. You just need to sign up, attach credit card reader hardware, and navigate the fees. Depending on the credit card tool, you'll pay a recurring fee for your merchant account, a percentage of each transaction, a flat fee per transaction, initial hardware costs, and possibly an additional monthly fee. This framework makes sense for businesses that process a lot of sales, keeping individual transaction fees low. 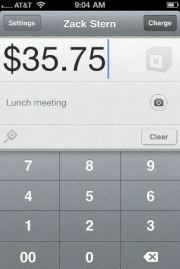 But a wild-card service--Square--eliminates that monthly overhead, instead charging more per transaction. Unfortunately, the app-based, smartphone RoamPay interface seems merely scaled up from dumb-handset navigation. For example, it presents a numbered list of options on each page instead of buttons, and you need to tap twice to make selections. Instead of the credit card swiper automatically turning on, you have to press a button to activate it each time, and if you use too much force--as we often did--you can wind up bending the hardware into the iPhone's sleep button, KO-ing your POS. RoamPay's weak interface hides some interesting features. 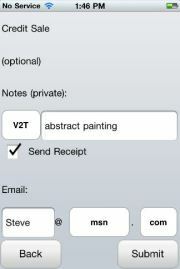 Tap V2T for voice-to-text transcription.